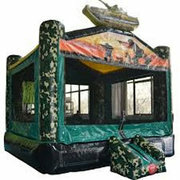 Description: The Camo Tank bounce house will get your party goer's attention. This bouncer has so much detail with all the camouflage and custom graphics your kids will come back requesting Camo Tank every time. This is a great unit for boys' parties or military functions or that special patriotic holiday. Perfect for any military theme party or decoration. Excellent for Army, Air Force, Marines, Coast Guard, and Marines function.